Taiwan’s defence ministry Tuesday unveiled plans to hold annual war games simulating a Chinese invasion of the island, despite president-elect Ma Ying-jeou’s pledge to ease tensions with Beijing. 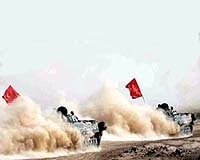 According to draft plans, this year’s war games will begin with a computerised drill in April and peak in September with a large-scale live-fire military exercise, the ministry said. “The exercises are aimed to counter the growing Chinese communist threat,” defence ministry spokeswoman Chi Yu-lan said, without providing further details. “What is important is that at least 80 percent of our combat strength must be preserved after their first strike, if we are to fight back,” he said. Ma, who defeated Frank Hsieh of the ruling pro-independence Democratic Progressive Party in a landslide in Saturday’s election, has promised to push for a peace treaty with Beijing to end nearly six decades of hostilities. But Ma has also vowed to build stronger forces which can serve as a deterrent against aggression from Beijing. Taiwan and China split in 1949 at the end of a civil war. Beijing still regards the self-ruled island as part of its territory awaiting reunification — by force if necessary.